So how do our relationships — and lives for that matter — happen to relate directly to our neurobiology? Some very compelling research has taken place over the years and it’s worth talking about. To begin with, science recognizes that we humans, as well as all mammals, share in common “three” — yes three — centers of intelligence. Centers from which we experience, perceive, and make discernments about what we are engaging with. We’ve been so acculturated to thinking that our intelligence resides only in our brains, in that grey matter that sits on top of our shoulders, that it might now surprise you to learn that there are actually three “locations” if you will from which we experience and make computations about the world. The Head Center. Also called the Mental Center, as well as the “Thinking” Center. The Heart Center. Also called the Emotional Center, as well as the “Feeling” Center. The Body Center. Also called the Physical Center, as well as the “Moving” Center. Fear/Anxiety – This reaction occurs when we experience a threat, challenge, or danger to our very security. This reaction is driven by the Head Center of intelligence, which is the center that figures out what makes life certain and secure for us. Distress/Panic – This reaction occurs when we experience the loss of connection and bonding. This reaction is driven by the Heart Center of intelligence, which is the center that innately pursues the need for bonding and love. Anger/Rage – This reaction occurs when we experience that we aren’t being treated right, are being violated, or that we are not getting/can’t get what we want/need at any given point in time. This reaction is driven by the Body Center of intelligence, which is the center that senses what is wrong about the world around us and how we need to take action to correct it/fulfill ourselves. These three fundamental reactions are very powerful, as they are high-alert reactions and they are not pleasant. They are intrinsic to the very core of our being, to the fundamental sense of well-being yes, and our downright survival to be blunt. Fear signals our direct knowing of what makes life secure, which let’s us get on with all of everything else we get to do here. Distress signals us to the deep need for as well as the absence of unconditional love, bonding, and “being held and touched” by others, and anger signals us to the disruption of our essential worth, place, and belonging to the world around us. While each of these reactions is critical to how we survive, develop, and grow, we virtually don’t do too well in life if these are constantly in full throttle. A process of adapting, adjusting, and managing these reactions becomes part of our development path. Although aversive in nature, these reactions are initially in place for good reason and are fundamentally well intended. They are compellingly present when the three basic needs for security/certainty, love/connection, and worth/wants are not being met/are threatened. 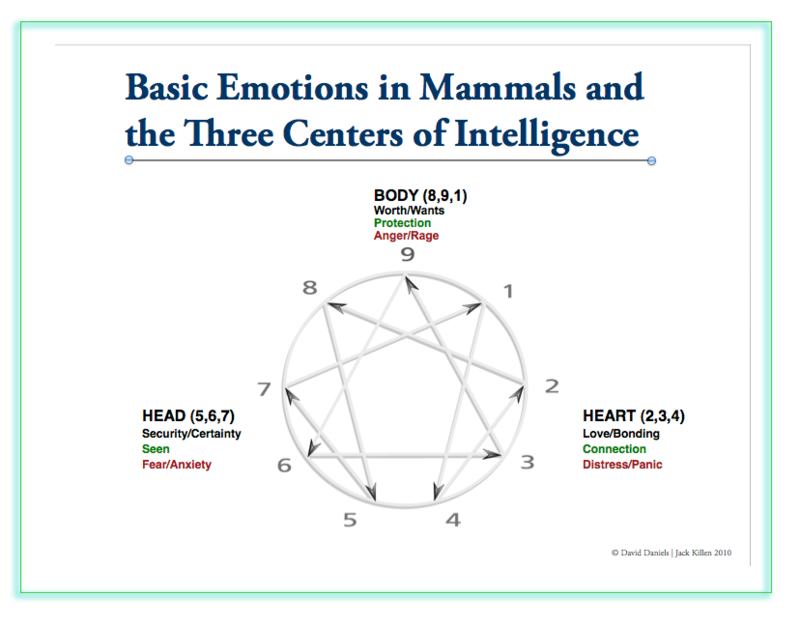 Figure 2 below shows the three basic needs, the three basic aversive reactions connected to each of these needs, and the specific center of intelligence to which each is connected. As touched on earlier, particularly Western psychology and education elevated mental intelligence (intelligence of the mind) to prominence as “the” center of intelligence. Yet we know without a doubt there are powerful intelligences located in the heart (intelligence of emotions) and deeper and lower in the body (intelligence of sensations and movement/action). The Enneagram acknowledges all three centers – Head, Heart and Body – and recognizes that each one is present in us all, and each requires ongoing cultivation. And while all of us relies on all three centers as its part of our natural design, each of the nine Enneagram types drive more heavily from one of the centers over the other two. The ability to recognize and learn to value from which center you yourself is driving from is a wonderful first step toward self-awareness. And secondly, to recognize, value, and then integrate all three centers of intelligence as “equally competent drivers” is crucial to all of us in attaining a fulfilling life and in cultivating relationships that flourish. It is vital to bring these into balance within ourselves first, and then within our relationships with others. If I am leading with the Head Center, I tend to filter the world through the mental faculties. The goals of this strategy are to minimize fear, to manage potentially painful situations ahead of time, and to gain a sense of certainty by employing mental processes of analyzing, envisioning, imagining, preparing, and planning. If we can figure out the world, understand and anticipate its requirements, we can gain security, follow the rules, and assess risks. This requires anticipating the future, both positive and potentially threatening manifestations, and developing pre-thought-out strategies to live by. All types depend upon mental intelligence to develop the higher qualities of the Head Center such as thoughtfulness, discernment, wisdom, and peace. Key Words: Security, Safety, Certainty, Acknowledgment, Assurance, Predictability, Thinking, and Opportunity. When we don’t experience these we react with fear/terror, as do all mammals along with variations of fear seen in humans such as anxiety, wariness, doubt, and apprehension. If I am leading with the Heart Center, I tend to perceive the world through the filter of emotional intelligence. I am attuned to the mood and feeling state of others, and am so in order to meet my own need for acceptance, contact, affection, bonding, and approval. I depend on, more than the other Enneagram types, the recognition and admiration if you will of others to establish my self-esteem and create an identity I perceive as loveable. This, in design, will assure me I can fulfill my need for love and bonding. To assure that I receive this approval and recognition, I tend to create an image of myself that will get others to value and accept me and see me even as special. Furthermore, the power of this center is amplified by the positive emotion called “care,” the good feeling that comes from the bonds we experience through relationships — an emotion shared with all mammals. The mammalian mother-child bond exemplifies this bond magnificently. Every Enneagram type relies on emotional intelligence to experience and develop the higher qualities of the Heart Center, which includes empathy, understanding, compassion, and loving-kindness. Key Words: Love, Connection, Affection, Bonding, Image, Feeling, and Approval. When we don’t experience these we react with distress/panic, as do all mammals along with variations of distress seen in humans such as sadness, longing, and shame. If I am leading with the Body Center, I tend to filter the world through an intelligence of my kinesthetic sense of movement and position in space, from physical/somatic sensations, and sensate knowing. I will use personal position and power to make life conform to the way it should be and to get what I want, and to get what is in my way of getting what I want, out of the way. I will tend to devise strategies that assure my place in the world, get what I want, and minimize discomfort. All types depend upon the Body Center of intelligence to develop the higher qualities of being that is in touch with the energy needed for action, to discern how much power to use to get what it wants and values, and to supply a sense of “being grounded,” of being here, in the world. In infancy, though not conscious that this is where we are, we are innately grounded in the present moment. Across our entire life, it is the Body Center that brings us back to the present moment and we do so by consciously calling on the Body Center to remember. When we are truly grounded (we know exactly who and where we are in time, space, and spirit), we develop healthy personal boundaries in that we’ve manifested having our own sense of personhood from which we can move through our own life, and healthily connect with others. Key Words: Personal Power, Worth, Respect, Congruence, Protection, Comfort, Taking Action, Harmonizing, and Sense of Belonging. When we don’t experience these we react with anger/rage, as do all mammals along with variations of anger seen in humans such as irritation, resentment, and impatience. While all three of the centers are essential to relationships, it’s the Heart Center that tells us about our bonds. It’s our connection to other that is most central to our experience of relationships. Understanding the neurobiology of care and bonding further validates the vital importance of our connections, of love, which I now further explore. To begin with, networks of nerve cells around the heart and throughout the body communicate directly with the social parts of our brain and with our middle prefrontal areas of the neo-cortex. It’s because of this network and it’s in this part of the brain that empathy, emotional regulation, and other integrative functions reside. Interestingly enough, humans (or all mammels too?) have a huge network of neurons and an electromagnetic field around the heart. It is like a “second brain.” Just remember that the brain yes, located in the skull, is actually composed of — and receives and sends information to and from — all of the neurons in the body. The right side of our brain’s cerebral cortex is more connected to the subcortical limbic feeling) system or mammalian brain as well as the hindbrain or reptilian brain and is in turn, more connected to emotions and instinctual reactions. The right cerebral cortex is more connected to our emotional life. It provides an analogical, descriptive perspective. The left side of our brain’s cerebral cortex provides a more digital, linear perspective. This side of the brain lends itself more to our “thinking” life. Furthermore, the area that lies between the thinking cortex and the feeling (limbic) cortex) is called the anterior cingulated cortex (ACC), and is vital to the transmission of physical energy levels, physiological functions, and the sensate experience of feelings. All the subcortical areas enable us to know how we feel, what our needs are, and what is meaningful to us. Our basic drives and emotions reside in the limbic region of the brain (basic drives also reside in the brainstem). The limbic region lies between the brainstem or reptilian brain, which regulates the basic bodily functions and the fight-flight-freeze response. The neo-cortex (front of the brain) regulates the functions that we think of as primarily human: the generation of ideas, thoughts, concepts, memories, values, and “the conceptual awareness” of feelings, desires, and the five senses. The limbic system connects through the brainstem to our bodies. It’s this connection, these neural pathways, that are core to giving life meaning. These pathways help us move toward pleasure and away from pain. Powerful often fear-based memories that evoke emotion reside here in a structure named the amygdala, a name coined because of its almond shape. Furthermore, another important area of the limbic system, the underlying hippocampus, serves to link and integrate all areas of the brain and store vital memories. And through the hypothalamus (a central area on the underside of the brain, controlling involuntary functions such as body temperature and the release of hormones) the limbic system contributes to regulating the hormone functions of the adrenal and thyroid glands as well as the genital organs, all of which play a significant role in our experience of connecting and bonding. And then there’s Mirror Neurons. Little did we know we are not as isolated within ourselves as we once might have thought. Studies in recent years have come to understand that we are in fact “social” animals with “social” brains — brains that to some extent “read” each other, tries to “mirror” each other’s experience. This “ability” if you will is made possible by something now termed “mirror neurons.” We all have mirror neurons in the frontal and parietal or side areas of our brain’s neo-cortex. These mirror neurons take in information about intentions and emotions in others that allows us to relate to and even experience these intentions and emotions. Of course, we’re passing this received data and interpreting it through our own lenses of perception, which can make things really interesting. Maybe even complicated! In this “exchange of data” process, mirror neurons actually create an emotional resonance with others and with behavioral intentions. These mirror neurons then link up with other cortex areas and, yes, the limbic system, through a central or midline area of circuits called the insula. Thanks to all of this amazing limbic-system circuitry, we are able to form an internal representation or map of others. Metaphorically and technically speaking we get linked together. Importantly, the experience of attachment, of connection to others, is thanks largely to our limbic area. Let’s go back now to distress and panic, the aversive reaction we plunder into when we lose attachment. Most of us have experienced a lost child’s distress or even panic. Or the natural and expected distress accompanying the loss of a loved one. Sadness and grief, variations of reactions to the loss of attachment, are reactions in the end that let us know how much we care, how much connection means to us, and how vital are these experiences to the whole of our being. Nurturance. What is nurturance? We all require it, literally, to grow, develop, and thrive. Yes of course we could speak of nurturance as food, but I am speaking more specifically to a nurturance that is separate from food that neurologically required largely by our limbic or mammalian brain. Removing the neo-cortex (thinking brain) of a hamster still allows the mother to nurture her pups. But even slight limbic damage destroys her ability to nurture. The limbic system is core to attachment, nourishment, and development. Studies conducted of infant mammals that are never picked up, thought fed well enough, still die from lack of physical, care and contact. Studies with infant monkeys show that baby monkeys raised in isolation didn’t even know how to reproduce, and couldn’t function sexually. Even some limited contact with young peers helped foster more normal reproductive and sexual development. Such studies reveal the undeniable important of attachment, of love, to development. Surprisingly enough, limbic nurturance can take precedence even over other basic survival functions and needs. Sadly, human infants raised in institutions where there is little human contact simply do not develop, let alone thrive. A chronological six-month-old may physically and developmentally resemble a three-month-old infant, even though given plenty of food and a clean physical environment. These infants instead become sickly and withdrawn, lose weight, and even die at rates over 40 times the expected rate. In “the old days” and before the dawn of antiobiotics, premature newborns were oftentimes excluded from all contact with parents. Placed in sterilized nurseries the hope was to prevent the possibility of the newborn catching an infection, based on the concern that infection would increase the likelihood of the infant dying. However, this practice actually increased the likelihood of the infant dying! Now parents are encouraged to have direct and immediate physical contact with their newborn, and thankfully so, mortality rates with this advancement in place have gone down. We simply do not survive without caring, physical contact, bonding, and connection. Mammals and Nursing. To further elicit nature’s amazing design for bonding, did you know that a newborn’s eyesight can only focus about eight inches in front of them for the first many months of life, just the distance needed to take in mommy’s breast and face? Furthermore, the nursing mother and infant experience a shared awareness of each other and the positive emotion of care, a profound exchange that all mammals share in common. When nursing the oxytocin, the feel good relationship neurohormone, goes up in both the mother and infant. And when the father or other caregiver holds the infant, the oxytocin goes up in them too. The newborn infant is designed to physiologically and totally recognize its mother and physiologically responds to her much differently than to a stranger. All that said, the study of neurobiology validates time and time again the vital importance of love and connection to our very survival, our very structure, and to our ability to develop and be in the world. What is Attachment Theory? It’s a theory (or group of theories) about the psychological concept of attachment: the tendency to seek closeness to another person and feel secure when that person is present. The understandings we’ve gleaned from the study of our own neurobiology, and how these studies further validate the Enneagram’s long-ago knowing of three centers of intelligence become further confirmed by the study of Attachment Theory, for which there is now much research data available. The study of Attachment Theory brings us to understanding “secure attachment,” the successful bonding of infant to caregiver that results in three fundamental, primal requirements having been met: The need to be Acknowledged/Seen (Head Center), the need to be Connected/Loved (Heart Center), and the need to be Protected/Respected (Body Center). When the parent or nurturing person is sensitive and present to its infant’s/child’s needs, secure attachment results and the child prospers. When the nurturing person, mother or other, does not respond to the child’s needs in reliable and sensitive ways, or ignores or detaches from the child, avoidant attachment takes place, which is characterized by the child shying away from connection. When the nurturing person is inconsistent, altering between attunement and insensitivity to the child’s needs, ambivalent attachment occurs in which the child manifests insecurity, often resulting in clinging due to limbic distress. Lastly, when the nurturing person shows unpredictable and deficient attunement, disorganized attachment results with the child not knowing what to expect. In this case, attachment strategies simply collapse. In limbic-system terms, this is the “3Rs” – limbic Resonance, limbic Regulation, and limbic Revision. Resonance simply means presence and receptivity — hearing the other as they are to themselves without judgment or agreement. We hear the child’s or other person’s melody so to speak, whatever its tune. Regulation means to balance and harmonize the connection to other and the ability to adapt within a range of responses. As a result, there is response-flexibility, resilience, emotional modulation, and contingent meaning-reliant communication. Revision takes place when we embody both Resonance and Regulation. It means we all have the capacity to affect each other and change each other through example, through “walking the talk” so to speak. So what does all this mean to us? It means that love is dependent on our limbic connections. It means that our ability to change and grow and adjust to love and for love and in love is dependent on our limbic system. When these 3 limbic Rs are present, harmony of connection results. In technical terms, the limbic system connects to the prefrontal region of the cortex, through the insula network of neurons, and from this, integration or assimilation takes place. In interpersonal neurobiological terms, secure attachment promotes the growth of integrative neurons in the middle prefrontal region of the brain. 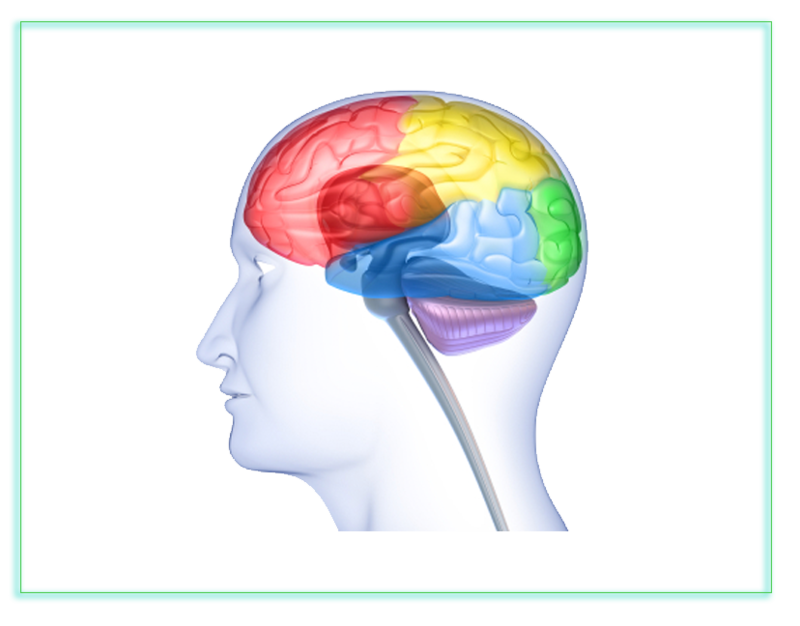 These vital, integrative, middle-prefrontal cortex functions include bodily regulation, attuned communications, emotional balance, fear modulation, response-flexibility, insight, empathy, morality, and intuition – all of which are thanks to the limbic system functions. Most importantly, all of us in relationships, not just parents, can learn and need to learn to develop consistent secure attachment behaviors in order to have and develop sustaining, fulfilling relationships. We can do this by developing mindfulness practices that increase our grounded presence, our response-flexibility that is fueled by curiosity, learning what states of non-judgment look like and feel like, and to communicate in ways that is congruent with the needs and well-being of both ourselves and others. These qualities acted out exemplify the definition and performance, and experience of love. Tack on to this our Universal Growth Process practices found in Part VI, which are fundamental daily practices for individual and relationships development. I encourage you and urge you to give yourself time to reflect on this material. Keep in mind our neurobiology, what we know about attachment theory, and the incredible tool we have at our disposal thanks to the wisdom of the Enneagram. With what we now know about our need to connect, our need to bond, and our ability to resonate with one another — a key component of the magic designed into our beings — it’s an exciting prospect to take our relationships and the power of their possibility, seriously. The effect on our lives may be incomprehensibly life-changing, beautiful, and magnificent. Wouldn’t you love to find out? This neurobiology effort has been done in partnership with Dr. Jack Killen, a physician and clinical researcher certified as an Enneagram teacher in the Narrative Tradition. Jack is deputy director of the National Center for Complementary and Alternative Medicine at the National Institutes of Health and has an abiding interest in Neurobiology and Affective Neuroscience of Mammals.